If you're having trouble getting a piece of power equipment started, we know how frustrating that can feel. You have a big job to do, and a stubborn engine isn't letting you do it. In this guide, we'll show you ways to breathe new life into your engine and when it's time to throw in the towel and start looking for a replacement engine. Is the tank filled with fresh gas? Are all safety devices/switches disengaged? Are you using proper starting procedures? Is the spark plug dry/wet? 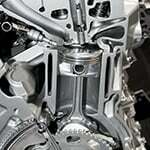 In order to easily diagnose problems, it helps to first understand how an engine actually works. Engines roar to life through a process called combustion. Combustion is nothing more than a controlled explosion that creates your engine's power, turning it into a usable mechanical force to get work done. In order for the engine to start, combustion requires a carefully choreographed compressed mixture of air, fuel, and spark that's precisely timed to ignite. If any one of these things are missing or out of sync, the engine will not start. Usually, the most common engine issues can be narrowed down to those three things. Sometimes diagnosing which one is missing can be a straightforward process, but other times the solution can become pretty complex, requiring more time and money than the tool is worth. Below, we've listed out some of the most common causes of small engine trouble. 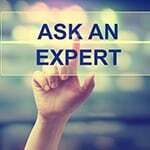 If the engine seems like it is hard to start or runs rough, checking the condition of the fuel is one of the easiest fixes you can make. If you suspect that your machine has expired gas inside, exchange it with fresh gas and add a couple bursts of starting fluid to the carburetor; it should come back to life. 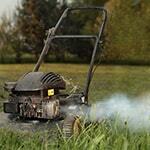 Take it from us, gasoline deteriorates fast and is responsible for ruining equipment more than any other reason. 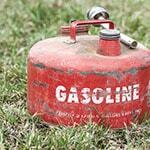 Fuel that's older than 1 month should never be used. Adding a fuel stabilizer to fresh gas is a good practice and cheap insurance to keep it stable longer, but won't bring back your petrol once it's gone south. Obviously, bad gas will result in poor or non-starting performance, but how does mummified gas actually ruin an engine? 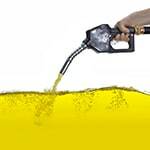 Gasoline, which is made up of many petrochemicals, detergents, and ethanol (corn alcohol), starts to separate and absorb moisture from the air after about a week. This degraded gas deteriorates rubber seals, fuel lines, and intricate metal parts forming a "gum" that is very difficult to remove. Use fresh gas. Add a stabilizer. Store gas properly. Never use gas past 1 month. Arguably the easiest maintenance item to perform is changing the air filter. 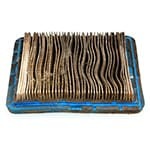 However, neglected over the long-term, an air filter that has failed will wreak havoc on an engine's pistons and cylinder walls until it stops dead in its tracks. There is no fix for a seized engine. Often overlooked, the mighty air filter is one of the most critical parts of the engine. If you think about all of the debris it will encounter from blades of grass to shards of wood, all it takes is an inconceivably small amount of dirt to become shrapnel in the engine to render it useless. If you want your engine to last, be sure to perform the quick and easy task of changing the air filter as soon as it gets dirty. Engines that run rough and puff a lot of smoke may be overdue for a tune-up. White smoke coming out of the engine can be caused by incomplete combustion where un-burnt fuel is being exhausted. A more serious problem is oil leaking into the cylinder as a result of worn piston rings or, worse still, a cracked engine block. For this fix, we'll concentrate on tuning-up your equipment. For the most part, a tune-up is as simple as: washing down the machine, changing the spark plug, oil, fuel filter and air filter, and giving the carburetor a good cleaning. A tune-up should be conducted on a yearly basis and you'll want to check your owner's manual for the specific procedures like getting the correct spark plug gap. However, if your engine's performance doesn't improve after a complete tune-up, it could be a sign of a more serious problem and a replacement engine may be in order. On rare occasions, it's possible that even a new spark plug is bad. The sensitive electrode inside can be broken if it is dropped, so it may be worth a few extra bucks just to be sure. Most commonly a result of improper starting, "flooding" results from various causes, including over-priming, closed choke, stuck valve, gummed carburetor, or immediately trying to restart an automatic choke engine. 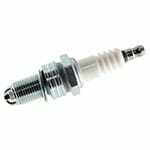 The easiest way to tell if your engine is flooded with gas is to remove the spark plug. If it's wet, it's flooded and you'll need to let the cylinder dry out before trying to restart. Compressed air can help speed up the process. But, what do you do if the spark plug isn't wet and you don't even smell gas? The opposite problem of flooding is the lack of fuel. If you keep your equipment in tip-top shape and are having a difficult time getting it started, it could be that you forgot something. 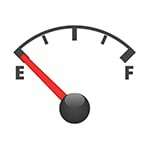 As silly as it may sound, take the fuel cap off and check to make sure there's gas in the tank. We get in such a hurry to get the job done, whether it's cutting the grass, trimming hedges, or blowing leaves, etc. that we forget to fill the equipment with gas. But, don't feel bad. We've all been guilty of this one at some point. In an attempt to reduce the number of accidents caused by power equipment, you'll notice there are more safety devices to contend with than ever before. One of them may be getting in the way of starting the equipment. So, you'll want to make sure the fuel shut-off valve is open and all operating switches are in the "on" or "run" position. If after you've checked to make sure all safety mechanisms are disengaged and the engine still isn't budging, it's time to check the fuel delivery system. Over time, fuel lines and primer bulbs can crack depriving the engine of precious fuel. Depending on the machine, these items can be replaced and fixing them can be a DIY project. On the other hand, carburetors that have gummed from bad gas can be very tedious to clean and is best left to the professionals. "Houston, we have ignition!" If your engine is getting enough fuel and air and still not starting, the issue could be a lack of spark. Even though spark plugs should be replaced yearly as part of the annual maintenance routine, they can fail for a number of reasons. Spark plugs can fracture internally after being dropped or during heavy vibrations, the electrode may be improperly gapped, or the ignition module/spark plug wire might be faulty. If after you replace the spark plug the engine still won't start, check the ignition module. A quick way to tell if the module is bad is to remove the spark plug boot and see if there's an electrical arc created after pulling the pull cord a few times. The arc will be created in the gap between the boot and the end of the spark plug. If there's no arc, then the ignition module will need to be replaced. Serenity is said to be defined by accepting the things you cannot change; courage to change the things you can; and wisdom to know the difference. That's where replacement engines come in to save the day. It's surprisingly simple to track down a direct replacement engine for your power equipment. You can read our small engine replacement guide or contact one of our engine experts if you ever have questions. Small Engine Troubleshooting Guide.. Our Power Equipment Direct how-to library can help you learn about Official Photo Contest Rules, What to Do When Your Engine Fails and Proposition 65 Product Labeling.